The Amish handcrafted Berkshire Bed is one of the most detailed pieces of furniture available in our Amish Bedroom Collection. The smooth curves and elegant detail in the head and footboard help the Berkshire Bed become a showcase piece in any bedroom. The raised panels and smooth curves bring the eyes to the natural grains of the wood, which reveal even more detailed woodwork in the bed. Because it is built with a hardwood and made by authentic Amish craftsmen, the Berkshire Bed is handcrafted to last a lifetime. Although the ideal bedroom fit for the Berkshire Bed is the Berkshire Bedroom Collection, it is customizable to fit your style and bedroom needs. 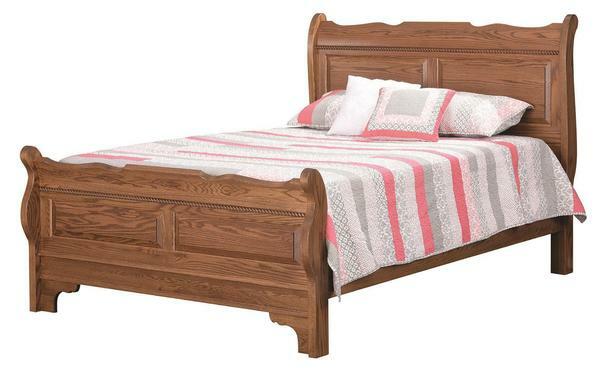 Although shown in a queen size, it also comes in a twin, full, king, and California king sized bed. The Berkshire Bed shown above is featured in an oak wood with a tawny stain. It is available in nine other wood options along with multiple stain options so you can customize it to fit your style! If you would like some assistance with ordering this Berkshire Amish Bed over the phone, or have any questions at all you can always call one of our furniture specialists at our toll free number 1-866-272-6773. We are also available through email at Questions@DutchCrafters.com where you will be taken care of by one of our experts! We look forward to helping you soon, thank you for shopping with DutchCrafters. Floor to Top of Side Rails: 14 5/8"
Floor to Bottom of Side Rails: 8 5/8"